All of our current weathervanes will be shown in this category, as well as Folk Art carvings, rocking horses and "whatever". Wonderfully carved miniature Mallard Ducks. Carved, painted and signed by Cape Cod carver “Florence Eldred Johnson 1970”. Excellent original condition. Each duck is 3″ long tail to bill. Beautifully done. Wonderfully carved miniature pheasant mounted on recovered driftwood. Artist also added 3 smaller pheasants (cast metal) for graphic interest. 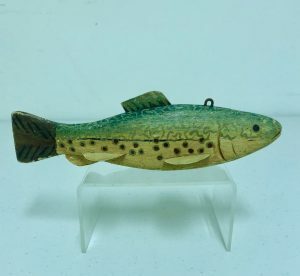 Carved, painted and signed by Cape Cod carver “Florence Eldred Johnson, 1971”. Excellent original condition. Pheasant is 3 1/3″ long tail to beak. Beautifully done with great color. 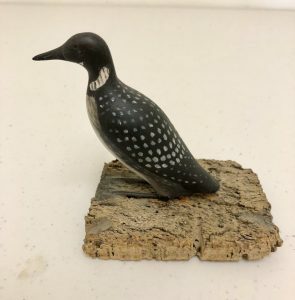 Wonderfully carved miniature Loon mounted on recovered drift wood. 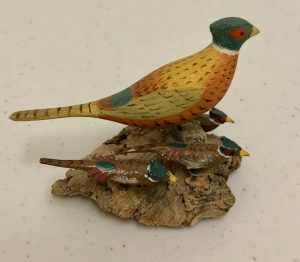 Carved and painted and signed by Cape Cod carver “Florence Eldred Johnson, 1971”. Excellent original condition. Loon is 4″ long tail to beak. Beautifully done in this small size. 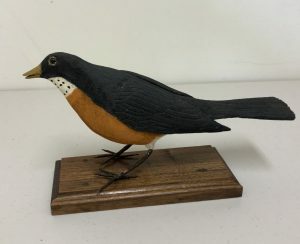 Nicely carved and painted life size Robin mounted on a mahogany display base. Robin is in excellent original condition – carving and paint. 9 3/4″ long tail to beak and 4 3/4″ tall not including the display base. It is signed on base “Art Wolfgram Waterloo” (Iowa). 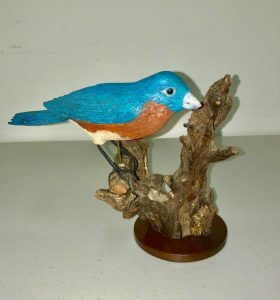 Life sized carved blue bird from a group of 4 bird carvings from a small town in Missouri, c 1940’s. A fifth bird was signed “Webber”. 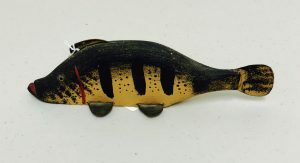 Colorful ice fishing (spearing) decoy. 7 ” long. 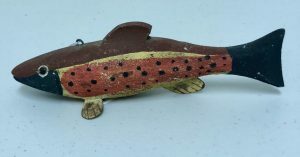 Upper Midwest, last quarter of the 20th C.
Nicely carved and painted Ice Fishing (Spearing) decoy, 7 1/2″ long. Found in Illinois but likely from Minnesota. Nice original condition with expected in use wear. 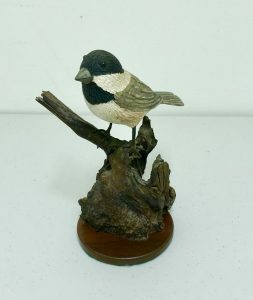 :fe Size carved Chickadee from a group of 4 bird carvings from a small town in Missouri, c 1940’s. a 5th bird was signed “Webber”. Large size 19th C. running horse weathervane commemorating the famous “Patchen” trotter. The vane conveys both the power and the beauty of this historic animal. The condition is excellent with just two small dents. The surface is likely original with a nicely worn patina and perhaps some surface touch ups. The size is 39 1/2″ long. From a western MA collection.